[ William Guy, Williakm Hayley and William Collins. ] Autograph Letter Signed ('W. Guy') from the Chichester surgeon William Guy to the poet William Hayley, giving the account for John Flaxman's memorial to William Collins in Chichester Cathedral. 1p., 12mo. Bifolium. Aged and worn. Addressed on second leaf to 'Wm. Hayley Esqr | Eartham, which also carries calculations, presumably in Hayley's hand. Guy gives a breakdown of '[t]he whole sum subscribed for Collins's Monument', £94 13s 8d, giving the amount spent 'for advertising &c.', 'conveying it to Chichester' and 'Mr West's Bill'. 'When these sums have been paid the balance in Mr.
[ Printed pamphlet. ] No. 6 of Tom Mann's 'The Industrial Syndicalist', with headline 'A Manchester Message to the Workers of Britain', devoted to a report on the First Conference on Industrial Syndicalism, Coal Exchange, Manchester, 1910. 48pp., thin 12mo. (20 x 9 cm.) Stapled. In good condition, on aged newspaper stock. Divided into ten sections: 'List of Delegates and Bodies Represented', 'The Conference', 'Chairman's Opening Remarks', 'Tom Mann's Address', 'The Resolution', 'The Discussion', 'A Weekly Newspaper' 'Manchester Syndicalist Education League', 'Parliamentary Action', 'Next Conference'. Ends with page on 'Industrial Syndicalism. What it is, and What it isn't', and two pages of details of 'Persons willing to speak as advocates of Industrial Syndicalism in their respective districts'. [ George Greville, 4th Earl of Warwick. ] Autograph Letter Signed ('Warwick') to Sir George Scharf, regarding five paintings (including a Rubens and a Canaletto) which he has at Stable Yard in London. 19 Stratford Place, Oxford Street [London]. 27 October 1856. 2pp., 8vo. Bifolium on grey paper. In good condition, lightly aged and creased. He has received Scharf's 'private list' (of paintings to borrow?) and will let him know 'which I can spare immediately'. In the meantime, as Scharf is in town, he suggests that he go and see 'what I have' in 1 Stable Yard, St James! - The pictures there belonging to me are a Canaletto - view of Venice - a Rubens - His own daughter - an Original of Mrs. Siddons, by Sir W. Beechey & a View of Jerusalem by D. Roberts'. Both items from the Cadiz Wine Company, 8 Duke Street, St James's, SW [London]. The facsimile of the Paas letter dated 18 May 1877. The printed advertisement with quotations dating from 1876 and 1877. Both items in good condition, on lightly-aged paper. The facsimile Paas letter: 1p., 12mo. Begins: 'Among our many regular Shipments from Cadiz few wines have attracted more general attention than our C.W.C. a magnificent Dry Sherry, very pale an delicate quite the Amontillado Character, perfectly free from Spirit and harshness'. Printed advertisement: 1p., 12mo. Headed: 'SPARKLING CHABLIS, 40s. doz. - This light, elegant and exhilarating Wine will be found superior to cheap Champagne, and is particularly recommended to Invalids for its purity, at so moderate a price. Original 45rpm record of 'South African Freedom Songs', sung by Pete Seeger, Robert Harter, Garrett Morris, Guy Carawan, Ned Wright, with booklet of words and music, with 'Notes by Peter Seeger'. In black 19.5 cm square sleeve, with striking cover design showing the aftermath of Sharpeville, and notice 'The American Committee on Africa receives royalties from the sale of this record.' The four songs are Tina Sizwe (We, The Brown Nation); Nkosi Waqcine (God Save the Volunteers); Asikatali (We Do Not Care If We Go To Prison); Liyashizwa (Pass-Burning Song). Very good, lightly-aged, with the record itself (in brown paper sleeve) seemingly unplayed. The twelve-page booklet is stapled, with illustrated cover and three photographs of the Sharpville Massacre. Hamlet [first edition of vol. II, inscribed by Miller]. Vol. II: 8vo, 465 pp., good condition. Inscription on fly-leaf: 'To | Guy Repp | from | [signed] Henry Miller | 3/4/42'. With R. J. Stanewick's ownership inscription in pencil on reverse of front wrap. (Miller signatures from this period are uncommon. The recipient Guy Repp was an actor associated in the 1930s with Orson Welles's Mercury Theater of the Air, who also featured in 'Citizen Kane'.) Internally tight and sound on aged paper, in worn and chipped wraps, with broken spines.. A few light pencil underlinings (by Stanewick?). The second volume is scarcer than the first. Ten Typed Letters Signed and eight Autograph Letters Signed (four 'Guy S Wellby' and the rest 'Guy') from Wellby to Franklin, with an inventory and valuation, schedule, accounts and correspondence relating to Rogers' collection of snuff boxes. Wellby's letters between 1948 and 1967; on letterheads of D. and J. Wellby Ltd. The collection, consisting of 31 items in a variety of formats, is in very good condition, on lightly-aged paper, with all texts clear and complete. Wellby's correspondence with Rogers (an affluent Kent businessman and farmer, collector and dabbler in the jewellery business) reflects a relationship at once businesslike and friendly, with items being offered by Wellby on behalf of his firm, and news of items consigned to the firm by Rogers. The personal element is apparent from the first. 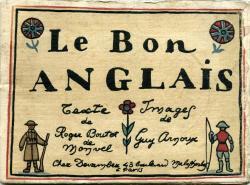 Le Bon Anglais Text de Roger Boutet de Monvel. Images de Guy Arnoux. Chez Devambez 43 boulevard Malesherbes à Paris. Landscape 12mo (leaf dimensions 12 x 16 cm): 27 pp. Stitched with no jacket as issued. Covers a little grubby, but a good copy of a scarce item. 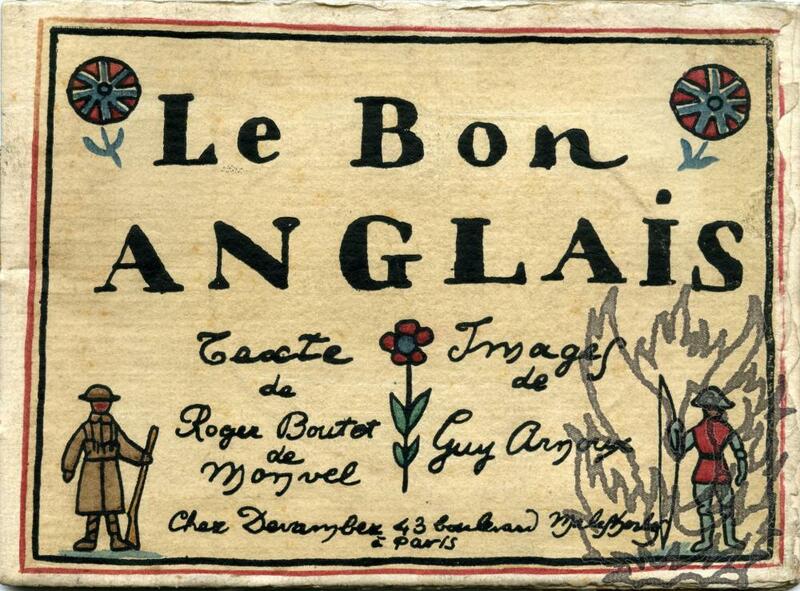 Title page and twelve delightful full-page pochoir illustrations by Arnoux, all hand-coloured: 'En temps de Paix', 'Premier contact', 'Le sous-lieutenant', 'Les Indiens', 'Black-Watch', 'Le capitaine et l'infirmiere', 'Les Irlandais', 'Le Major', 'La Mascotte', 'Ship ahoy!! ', 'Le bon Ecossais' and 'God save the King'. The Commune. William Morris, Issue. Special Number. [Second Series. Vol. II., No 2. February 1927.] 'Edited and Published by Guy A. Aldred, 13, Burnbank Gdns. Glasgow. W. (Scotland)' ['Printers and Publishers, Bakunin Press']. 8vo: 80 pp, paginated 13-92. Stapled. In original grey printed wraps. Clear and complete. On aged and spotted high-acidity paper, with rusting from staples. In worn and spotted wraps. 2 cm closed tears to back wrap and outer margins of last two leaves. Pencil note on inside of back cover that a copy of the same item sold by Hodgkins for £30 in March 1986. From the collection of the Scottish anarchist author H. T. Derrett, and with his ownership inscription and date on front wrap. Illustrated. Two Deeds Indented (Indentures), relating to the purchase by Guy of various Yorkshire estates, and the sale by him of the same to Sir Cyril Wyche. Indentures of 18 July 1672 and 11 March 1674; receipt of 12 August 1672; particular of 18 July 1672. INDENTURE OF 1672: 'ex[ecute]d. by Rich: Lighfoot Clerk to ye Trustees', on one side each of two large vellum skins. Wear at folds, affecting the occasional word or phrase. Docketed on grubby reverse of first skin. Borders in red, and with attractive hand-drawn Royal Crest within large initial at head. 'Betwene the right honourable ffrancis Lord Hawley Sr. Charles Harbord Knight his majesties Surveyor generall Sr. William Howard of Tandridge in the County of Surrey Knight Sr.
Autograph Letter Signed to [Osbert Guy Stanhope] Crawford. 7 September 1955; on letterhead of the Athenaeum Club, Pall Mall. One of the editors of the Dictionary of National Biography (born 1882). The recipient (1886-1957) was a noted archaeologist. Two pages, 12mo. In poor condition: creased, grubby, worn, stained and repaired. Weaver has just been reading Crawford's 'extremely interesting autobiography with its most original title' ('Said and done.